The name comes from the Scuppernong River in North Carolina mainly along the coastal plain. It was first mentioned as a "white grape" in a written logbook by the Florentine explorer Giovanni de Verrazzano while exploring the Cape Fear River Valley in 1524. He wrote "...Many vines growing naturally there...". Sir Walter Raleigh's explorers, the captains Philip Amadas and Arthur Barlowe, wrote in 1584 that North Carolina's coast was "...so full of grapes as the very beating and surge of the sea overflowed them...in all the world, the like abundance is not to be found." He may have been referring to Sargasso seaweed from coral reefs, which can be seen washed up on shore after a major storm off the NC coast. The seaweed has berrylike gas-filled bladders looking much like grapes to keep the fronds afloat. However, in 1585, Governor Ralph Lane, when describing North Carolina to Raleigh, stated that "We have discovered the main to be the goodliest soil under the cope of heaven, so abounding with sweet trees that bring rich and pleasant, grapes of such greatness, yet wild, as France, Spain, nor Italy hath no greater...". It was first cultivated during the 17th century, particularly in Tyrell County, North Carolina. Isaac Alexander found it while hunting along the banks of a stream feeding into Scuppernong Lake in 1755; it is mentioned in the North Carolina official state toast. The name itself traces back to the Algonquian word ascopo meaning "sweet bay tree". The fruit grows where temperatures seldom fall below 10° Fahrenheit. Injury can occur where winter temperatures drop below 0° Fahrenheit. Some cultivars such as Magnolia, Carlos, and Sterling survive north to Virginia and west to the Blue Ridge Mountain foothills. Muscadines have a high tolerance to diseases and pests. Over 100 years of breeding has resulted in several bronze cultivars such as Carlos, Doreen, Magnolia and Triumph, that are distinguished by being perfect flowered (male and female flower parts together) from the Scuppernong variety with only female flower parts. 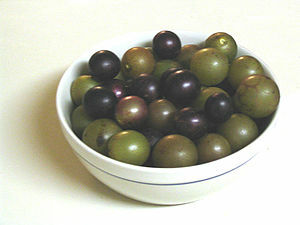 ^ "USDA Plants Profile Muscadine". Plants.usda.gov. Retrieved 2012-08-09. ^ "North Carolina State University Muscadine Grapes". Ces.ncsu.edu. 1914-06-30. Retrieved 2012-08-09. ^ "Official State Symbols of North Carolina". ncpedia.org. Retrieved 2012-09-26. ^ "North Carolina Wine & Grape Council and NCDOC". Scuppernongs.com. Retrieved 2012-08-09. ^ "GS_149-2 "A Toast" to North Carolina 2005". Ncleg.net. Retrieved 2012-08-09. ^ Poling, Barclay & Fisk, Connie (June 2006). "Muscadine Grapes in the Home Garden". NC State University Horticulture Information Leaflets. Retrieved 2008-09-25. ^ "North Carolina History Project : Mother Vine". Northcarolinahistory.org. Retrieved 2012-08-09. ^ Kozak, Catherine (July 14, 2008). "Mother of all vines gives birth to new wine". Virginian Pilot. Retrieved 2008-07-15. Look up scuppernong in Wiktionary, the free dictionary.